The Truth about Gallbladder and Liver "Flushes"
Gallbladder and liver "flushes" are widely advocated as a way of treating gallstones and helping with medical conditions ranging from allergies to cancer [1-4]. In the usual “flush,” half a cup or more of a vegetable oil is consumed together with citrus juice and Epsom salts (magnesium sulphate), usually after a brief fast. Many green, brown, yellow or black blobs of various sizes may later appear in the bowel movements. Some bear a slight resemblance to gallstones, but they are not stones. They are merely bile-stained "soaps" produced by partial saponification (soap formation) of the oil. A recent demonstration found that mixing equal volumes of oleic acid (the major component of olive oil) and lemon juice produced several semi-solid white balls after a small volume of potassium hydroxide solution was added. After air-drying at room temperature, these balls became quite solid and hard. When formed in the intestine, these objects absorb bile and become green . It has also been shown that red dye will appear in the interior of the “stones” if consumed with the oil . The fact that the material is due to some kind of transformation of the oil is clear from user descriptions and ultrasound images. The most obvious evidence is that the alleged “stones” float on the toilet water [2,3,6], as might be expected of a largely oil-based substance. Gallstones sink. Patients with medically diagnosed gallstones may be able to confirm this for themselves by looking at their own ultrasound scans.The stones, if free to move, will settle at the lowest part of the gallbladder, even though bile is much denser than water. The picture to the right shows a cross-section of the gallbladder (the oblong black area) with three moderately large stones in the lowermost area. They tend to dissolve into an oily smudge in time, or with heat . Patients are advised to keep them in the freezer [1,2]. Gallstones are stable. They have an irregular globular shape and in the many available photos  never display the sharply facetted appearance that gallstones often have when rubbing up against each other in an overcrowded gallbladder. They are usually described as soft  and waxy or “gelatinous” . Real gallstones are often very hard and difficult to crack. Softer gallstones always have a fine, crumbly, dry texture. Gallstones are thus difficult to cut cleanly with a knife, unlike the “stones” shown at http://curezone.com/ig/i.asp?i=7072. They may be bright green and possess a translucency never seen in gallstones. They can be produced in amounts far beyond the capacity of either the gallbladder or the entire biliary system, as long as flushes are continued and regardless of whether the user still has a gallbladder. It seems likely that gallstones might occasionally be expelled. Small stones are regularly expelled from the gallbladder. There is some risk that stones over about 5mm in diameter will lodge in the bile duct, but most pass on into the bowel and out of the body unnoticed. Gallbladders may spontaneously empty themselves of small stones, but this is rare . Also, the large oily meal would stimulate strong gallbladder contraction. This could help expel small gallstones or even, very rarely, a whole crop of small gallstones or sludge. Whether the whole ritual is needed is another matter. A meal of fried fish and chips, or the “whole fat milk and a Mars bar” sometimes used to stimulate gallbladder contraction during x-ray examinations might serve as well. The magnesium sulphate (Epsom Salts) could have an added effect, as it also stimulates gallbladder contraction and relaxes the muscles controlling the release of bile into the intestines. However, it acts in the same way as would fat or oil, causing the release of cholecystokinin from the upper small intestine . The availability of that hormone and the ability of the gallbladder to respond to it would be limiting factors. The chance of success is further diminished by the fact that patients with symptomatic gallstones often have impaired ability of the gallbladder to empty (a factor in gallstone formation), stones that are too big to pass, or a blocked gallbladder duct (the “non-functioning gallbladder” in contrast studies). Moreover, it can be predicted that even if occasionally successful, most patients would go on to form more stones. 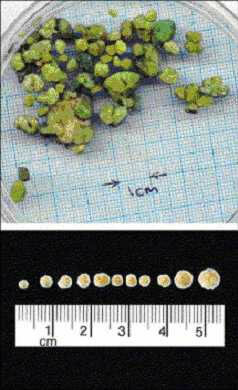 After successful dissolution of gallstones with ursodeoxycholic acid, 30-50% of patients form new stones within five years . Despite much research, no simple, safe, or dietary measure has been found to prevent gallstone formation. The traditional fat-free diet has shown no consistent benefit , possibly because an occasional fatty meal helps expel small stones or sludge. This may be why patients on prolonged intravenous feeding are prone to develop gallstones. In a popular variant, large quantities of apple juice are consumed in the days prior to the olive oil and lemon juice (or equivalent). Its supporters claim that apple juice is a stone solvent , usually offering in support a reference to the prestigious medical journal, The Lancet . The cited item, “Apple juice and the chemical-contact softening of gallstones,” is merely a brief letter to the editor stating that the writer's wife had passed soft, brown, “fatty stones” after drinking a lot of apple juice and then a cupful of olive oil, apparently as part of a gallbladder flush. This source offers no evidence that apple juice can soften gallstones. Actually, there is no way for apple juice or any other agent taken by mouth to come into contact with stones in the gallbladder or bile ducts. A very effective sphincter muscle prevents intestinal contents from leaking back into the bile duct or gallbladder. Thus there is no logical reason to believe that any of the materials consumed in the "flushes" (oils, fruit juices, magnesium sulfate) could soften or otherwise affect the characteristics of gallstones in the gallbladder or bile ducts. Bile salts such as ursodeoxycholic acid can do so, but they must be absorbed into the blood stream and processed by the liver before they can affect the ability of bile to dissolve cholesterol stones—and a minimum of nine months of treatment is usually required. "Flush" proponents claim that liver stones are common, and one has even stated that 99.95% of cancer patients have them . However, stones within the small liver ducts are very rare, at least in Western communities, as might be expected because the bile produced by the liver is 5-10 times less concentrated than gallbladder bile. Small stones released by the gallbladder will occasionally drift into a liver duct. Otherwise stones mainly only develop in the liver ducts secondary to other serious biliary pathology such as strictures, choledochal cysts or bile duct cancers. Their rarity, even in patients known to be prone to stone formation is illustrated by a recent study on patients with gallstones but with no other biliary problems . Only 3.5% of such patients were found to have stones in the bile ducts when imaging studies (cholangiography) were performed during their surgery. At least 95% of such stones were in the main bile duct, usually beyond the entrance of the gallbladder duct. Cholangiography can detect stones as small as 1-2 mm in the narrow liver ducts. In patients with reasonable health and no complicating factors, flushes are generally safe. Consuming fatty foods may carry a comparable risk of stones getting stuck in the wrong place and provoking biliary colic or complications such as acute pancreatitis. Similar concerns once applied to gallstone dissolution using ursodeoxycholic acid and to the shattering of gallstones with shock wave lithotripsy, but in practice complications are fewer than expected. I cannot recall yet seeing any reports of harm from a gallbladder/liver flush. The greatest risk may apply to those who postpone surgery despite being at risk of major complications i.e. those with regular symptoms or who have recovered from potentially lethal complications such as acute pancreatitis or acute cholangitis (bile duct infection). One woman who complained that her gallstones were unchanged on ultrasound despite three apparently fruitful flushes was advised that to up to 25 flushes may be needed. The above considerations suggest that very, very few will succeed no matter how many times they flush. Anonymous. Science Project: Dyeing to know the answer. CureZone posting, accessed Feb 18, 2007. Clark HR. The Cure for all Diseases. Chula Vista, CA: New Century Press, 1995. Liver flush & liver cleansing & gallstones: Frequently asked questions (FAQ). CureZone posting, accessed Feb 18, 2007. Wong C. Liver flush. Alternative Healing Centre Web site, accessed Feb 18, 2007. Kelley WD. One Answer to Cancer. Kelley Foundation, 1974. Gray R. Disappearing gallstones: Report of 2 cases. British Journal of Surgery Volume 61:101-103, 1974. Wiener I and others. Correlation between gallbladder size and release of cholecystokinin after magnesium sulfate in man. Annals of Surgery197:412-415, 1983. Collins C et al. A prospective study of common bile duct calculi in patients undergoing laparoscopic cholecystectomy: Natural history of choledocholithiasis revisited. Annals of Surgery 239:28-33, 2004. Georgiou GJ. Flush gallstones naturally. Worldwide Health center Web site, Nov 13, 2003. R Dekkers. Apple juice and the chemical-contact softening of gallstones. Lancet 25:354, 2171, 1999. This article was revised on March 9, 2007.